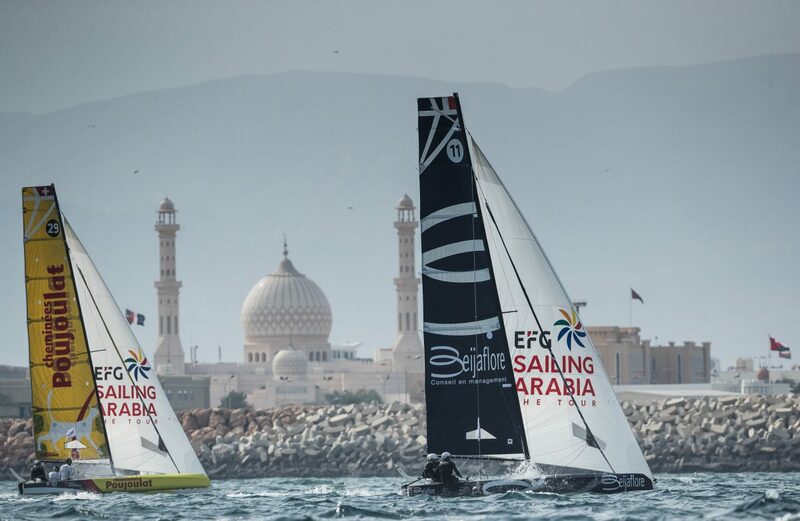 Beijaflore made it three wins in four coastal raids today, taking the top spot in EFG Sailing Arabia – The Tour’s penultimate offshore race from Ras Al Hadd to Sur. 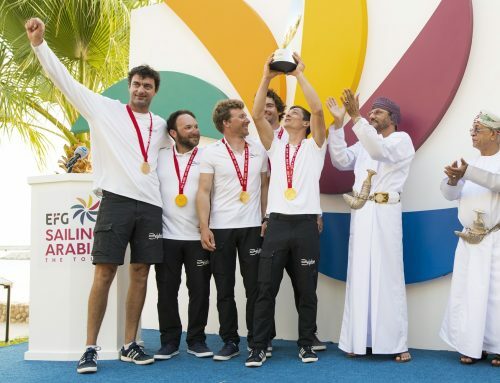 The polished French crew emerged victorious from a close 30-mile battle with the regatta’s top teams Averda, EFG Bank Monaco and Cheminees Poujoulat as the fleet of Diam 24 multihulls traded blows along Oman’s stunning coastline. 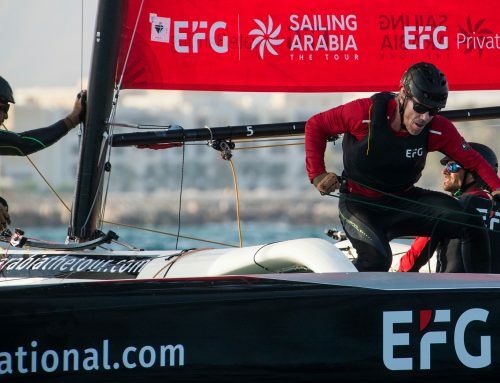 Beijaflore have proved themselves the team to beat since the start of EFG Sailing Arabia – The Tour on February 5, with victories in the Salalah and Duqm coastal raids as well as stadium racing on a much shorter, inshore course in Salalah under their belts going into today’s race. The event favourites found themselves mid-fleet as the coastal raid got underway from Ras Al Hadd, on Oman’s most easterly tip, with the eight-strong fleet facing blustery winds gusting up to 20 knots. Cheminees Poujoulat, led by Swiss offshore sailing star Bernard Stamm, took an early lead, with British two-time Olympian Stevie Morrison’s Averda and Beijaflore pushing the frontrunners hard. The super-quick Diam 24s didn’t take long to reach the historic maritime city of Sur, famed for being the most eastern city in Arabia, at which point Averda overhauled Poujoulat. 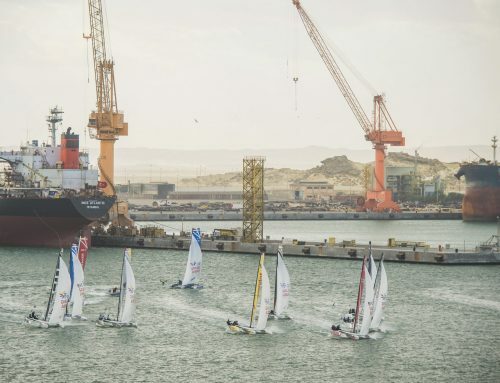 Morrison’s crew, including talented Omani sailor Abdulrahman Al Mashari and top British sailor Nic Asher, built up a decent lead but disaster struck just before the downwind mark when the fitting holding their foresail to the deck broke. 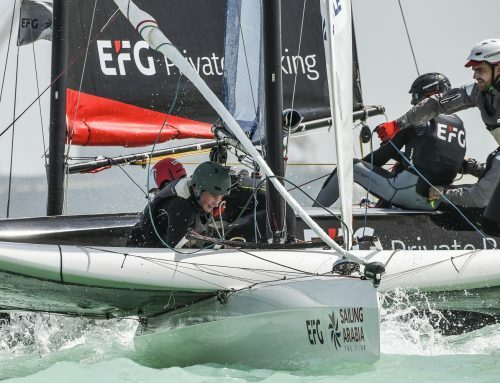 By this point Beijaflore had overtaken Poujoulat, and reigning EFG Sailing Arabia – The Tour champions EFG Bank Monaco had joined the fight for first. With Averda wounded, Beijaflore were able to pass them and notch up yet another win. Morrison’s men, meanwhile, were able to overhaul Stamm’s Poujalat outfit before the finish to come home in second. EFG Bank Monaco finished fourth, ahead of Vivacar.fr, Renaissance and DB Schenker. Lorina Golfe du Morbihan did not take place in the race for technical reasons. The results leave Beijaflore sitting comfortably at the top of the overall leaderboard with just three more opportunities to score points remaining. Second place sees Averda consolidate their place on the final podium behind current runners up EFG Bank Monaco. “We seemed really quick today – Abdul did a great job with his trimming, and Nic found us some really nice lanes,” Morrison said. Poujoulat’s third sees them jump up the overall rankings from sixth to fourth, six points behind Averda. 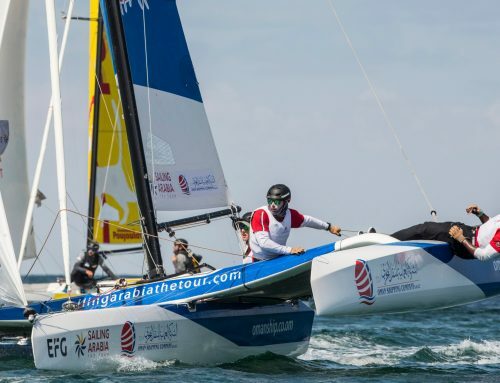 Tomorrow sees stadium racing in Sur followed by a coastal raid between Bandar Al Rowdha and Muttrah and stadium racing in Muttrah before the winners of the 2018 EFG Sailing Arabia – The Tour are crowned on February 17.